Every January sees a surge in growth. This January, with 96 people joining our community, combined with reinstated members, the expansion is remarkable! 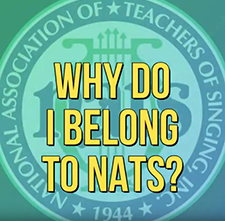 NATS is celebrating its largest group of new members yet! Whether joining for professional opportunities or continuing education, January is often a favorite time to become a NATS member. The benefits of a full year of Journal of Singing, networking, and support, means every January for the last six years has seen a surge in growth. This January, however, it turned into a flood, with 96 people joining our community. Combine that with reinstated members, and the expansion is remarkable! Who are these new people? Among them are teachers of Indian classical singing, jazz, Western classical, music theater, and rock. They are choral directors, European teachers and singers, collab pianists, and students! Oh the students! Twenty people joined NATS as student members in January alone! This growth would not be possible without the support of the Regional Governors, District Governors, Chapter leadership, and the Membership Committee. The Membership Committee has focused on creative outreach opportunities. The Regional Governors, District Governors, and Chapters have lead the way for networking at the grass roots level, showing our newest members how to become involved close to home. And altogether we try to make sure that the people who can benefit from NATS know that they are welcome here. Add to that a useful new tool, a pop-up window on the nats.org/membership page. When a new visitor comes to NATS’ website, they can enter a request for information and someone at headquarters and the region will reach out to them. The popularity of this tool is clear - it has exceeded our expectations. Welcome, new members, returning members, and student members! We are so glad to have you with us. WELCOME, NEW MEMBERS! See who has recently been accepted for NATS membership.